Consequently, I felt compelled to write this article because this question is highly representative of what I consider my current life’s work. I have been in the investment business since 1970, and over those many decades, I have always followed a strict valuation investment strategy. However, when I was younger, I applied valuation to growth stocks because my objective was to build as much wealth as possible. As I have matured, my objective has become more focused on protecting my wealth while simultaneously letting my money that I worked so hard for to start working for me. In simple terms, I evolved from a growth investor into a more conservative dividend growth investor. The comment cited above asked to see actual data and nothing theoretical. Personally, I think that is a fair request because for theoretical to have any real value, it must apply under real-world circumstances. On the other hand, for a hypothesis (theory) to be proven, it must first be clearly articulated and laid out. Therefore, what follows is the theory, or perhaps more appropriately, the rationale as to why valuation has a material impact on total dividend payments. The first and most important point about dividends are that they are paid on the number of shares owned. Consequently, regardless of what happens to the share price of the dividend stock once it’s purchased, the dividend amount is calculated based on the number of shares owned. Therefore, even if the stock price falls dramatically, your dividend income will remain the same and vice versa. Consistent with this first point is the reality that lower valuation is simultaneously associated with lower stock prices – ceteris paribus. Therefore, when you buy a given stock at a lower valuation, you are initially purchasing more shares than had you bought it at a higher valuation. In this regard, price and valuation are related, but they are not the same. To be clear, a higher price earnings ratio related to a given level of earnings results in a higher price than a lower price earnings ratio related to the same level of earnings. Moreover, it is true that the specific growth rate of the dividend itself (the rate of change of growth from one year to the next) will be identical regardless of valuation. However, the starting yield, which is often referred to as yield on cost, will be higher at a lower valuation than at a higher valuation. Consequently, your future yield will be higher, but more importantly so will your future level of cumulative dividends received. I offer this second excerpt in order to establish a clarification. If the question relates to the current investment, the “elevated valuation” will not change the future dividend growth nor the total payments of that investment. However, if the “$12,000” is invested into a lower valued company that offers a higher current yield than the original investment is currently offering, then the future dividend payments will be significantly higher. On the other hand, the dividend growth of either the original or the new investment will be directly proportionate to the amount of operating growth and subsequently dividend growth rate that each individual investment would achieve. 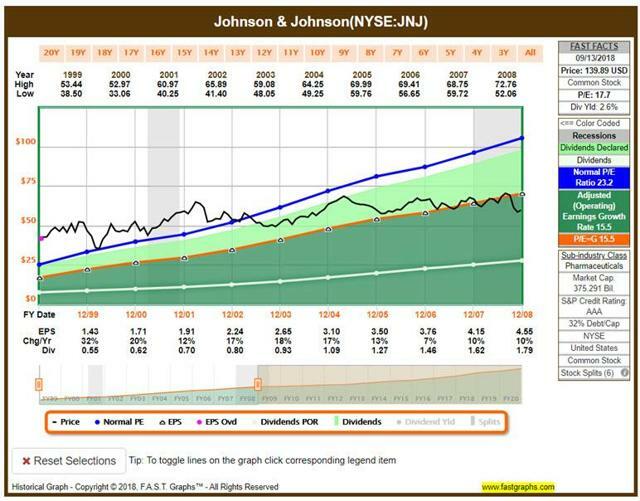 The following screenshots cover purchasing Johnson & Johnson (NYSE:JNJ) over two historical 10-year time frames. With the first, Johnson & Johnson is purchased when valuation was excessive, and the second when Johnson & Johnson was purchased when valuation makes sense. Both historical earnings and price correlated graphs, as well as the associated performance graphs, tell the story. However, to really receive a clear explanation of how and why this works, I suggest the reader watch the analyze out loud video covering the same time frames that follows. In the following analyze out loud video, I’m going to clearly illustrate how valuation does have a material impact on the dividend income. As an aside, valuation not only has a material impact on dividend income, it also has a major impact on total return. As a clue to what you will see in the video, when Johnson & Johnson was purchased when it was overvalued was also during a time when its earnings growth was over 13%. In contrast, when Johnson & Johnson was purchased when it was undervalued was during a time when its earnings growth rate was only 6% or half as fast. 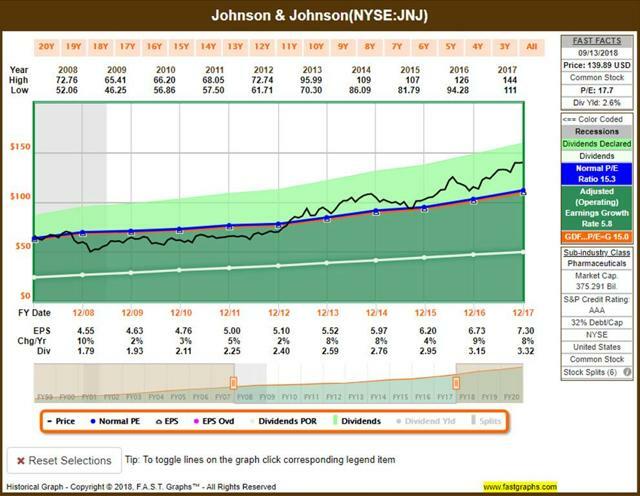 Nevertheless, Johnson & Johnson delivered more dividend income and a higher total return thanks to attractive valuation even though its growth rate was much lower. In summary, and with all things remaining equal, you can increase your income and your total return by selling an overvalued dividend growth stock and reinvesting into a similar quality undervalued dividend growth stock. It’s important to remember that in both cases, the forecast of future growth is equally as tenuous. In other words, this will not work out if the original investment continues to grow while the new investment falters. Therefore, the concept of similar quality is essential, as well as the predictability of future growth. Consequently, I do not suggest that investors act impetuously or frivolously when making buy and sell decisions on their portfolio. I’m a fervent believer in the old adage that “a portfolio is like a bar soap, the more you handle it the smaller it gets.” Therefore, and to be clear, this kind of strategy only works over a complete business cycle. Investors need to recognize that out-of-favor stocks tend to stay out of favor for a period of time and in favor stocks likewise. In other words, these decisions make sense as long-term decisions and not as short-term trading decisions. Disclosure: I am/we are long JNJ.